Sports brand ASICS is launching its inaugural Asics City Relay, a full marathon event in relay format involving four participants. 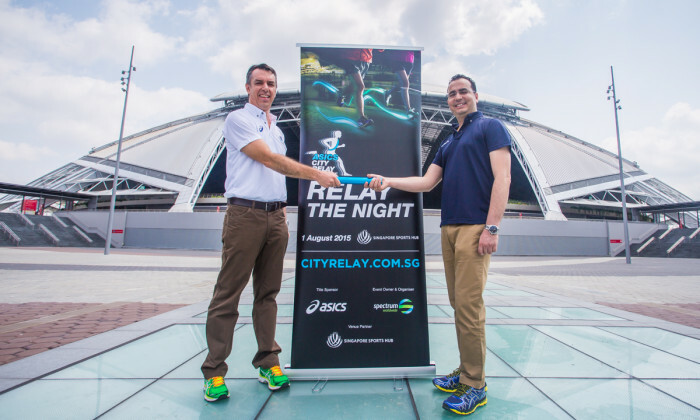 To be held at the Singapore Sports Hub on 1st August 2015, the ASICS City Relay will be Singapore’s first ever night marathon relay-only event. The unique format of the ASICS City Relay will see each team member run one lap of the course around the Sports Hub precinct with changeovers taking place within the new National Stadium.“Live” results will also be broadcasted on the two giant LED screens within the stadium to keep supporters updated on the leading teams. “ASICS have long been associated with marathons globally in many countries,” said Yogesh Gandhi (pictured right), general manager for ASICS Asia. “We see the ASICS City Relay as having massive potential here in Singapore. The relay format has proved hugely popular and with the exciting new Sports Hub venue, we’re set for a truly exciting night race which is quite different to any other existing event on the local race calendar,” said Chris Robb (pictured left), CEO, Spectrum Worldwide, the company that is also responsible for organising the Standard Chartered Marathon Singapore and Cycle Asia. Spoof ads are often funny but these ads tackle a larger issue. Take a look. ..